Over these last few years it seems as tough anything that is both small and cordless is by default made to run off of the 12V rechargeable batteries. But what about the people that are invested into the 18-volt battery system, or people without either? This is where Porter-Cable has done something that I really like, they have introduced both an 18-volt (PCC581B ) and a standard alkaline 9-volt version (PCC582B ) of their new Infrared Thermometers. I should also note that the 18V version is compatible with PC 18V Lithium-ion and NiCd batteries. The IR Thermometers have some really great features that make it even easier to spot the differences in temperature. Beside the backlit LCD display, both units also feature a temperature indicator beam that changes color based on heat differences in the room. 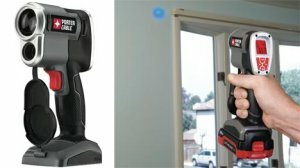 Simply pull the trigger on one of the tools and a green indicator light will appear wherever the unit is pointed; if you move the beam to a cooler area, it will turn blue, or it will turn to red if it is moved to a warmer area. This feature should make it easy to quickly spot the hot and cold points in a room. The thermometers both have a working range of -22 to 590 degrees Fahrenheit and an accuracy of plus/minus 1.8 degrees, and a 12:1 distance to spot ratio accuracy. The unit also feature a 10 bank memory system that can be used to store temperature readings, or be used to capture readings in hard to reach areas. Both models will be available in November and will retail for about $60 each. The PCC581B is sold as a bare tool.